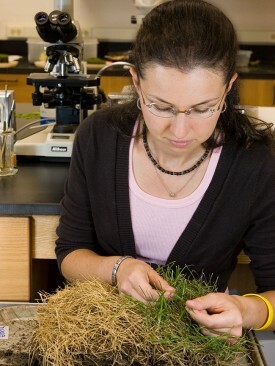 Share the post "Rutgers Plant Diagnostic Laboratory: A Resource for Plant Professionals and Home Gardeners"
Since the days of Rachael Carson and Silent Spring, plant health managers, green industry professionals, and home gardeners alike have been looking for ways to reduce the impact of pesticides in the food supply as well as the lawn and landscape. From outright pesticide bans, to highly specialized and precision integrated pest management systems, the quest for healthy plant systems with less input is ongoing. Proper identification of the cause of a plant problem is the first step in any disease or insect pest management program. Only when one is aware of the cause, can appropriate interventions be made. For instance, there are many species of borers in shade trees. Some are invasive and some are native, but being able to distinguish them from each other is important in determining how much of a threat they pose, if a regulatory response is necessary, whether or not they can be controlled, if they can be eliminated or prevented, and when, what and how to apply a treatment. Even if there is no prescribed treatment for the problem, knowing the cause of the plant’s decline provides important information for selecting new plants or modifying the site for replanting. Some disease problems are easy to identify, but others can be misleading. For example, several different fungi as well as certain insect pests, or abiotic stress factors, like poor drainage, can cause problems in the crown and root systems of plants. The symptoms of these plant problems in the field can be virtually identical regardless of the cause. Accurate identification of root-infecting fungi requires at least a microscope, and often needs special isolation or testing techniques that would only be available in a laboratory setting. Since 1991, The New Jersey Agriculture Experiment Station and Rutgers Cooperative Extension have maintained the Rutgers Plant Diagnostic Laboratory to assist with the plant health diagnostic needs of the residents of New Jersey. Our mission is to provide accurate and timely diagnosis of plant problems. Since inception, the Plant Diagnostic Laboratory has processed over 48,000 plant samples with an average response time of 2.29 days per sample. 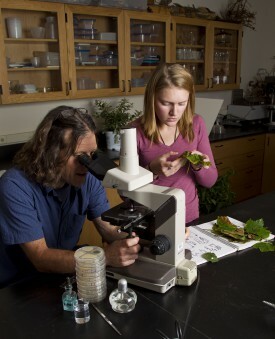 The Plant Diagnostic Laboratory is staffed with two diagnosticians trained in entomology and plant pathology as well as a rotating cast of student assistants. The laboratory staff works in cooperation with other experts within Rutgers University. We also cooperate, through the National Plant Diagnostic Network, with diagnosticians at other Land Grant Universities, and with regulators at the New Jersey Department of Agriculture and with USDA-APHIS-PPQ. Sampling and submission instructions, including the services provided and the fee schedule can be found on the website: www.njaes.rutgers.edu/services. While you are there, check out the Rutgers Soil Testing Laboratory page for your soil fertility testing needs. Plant samples can be mailed or dropped off at the lab. Each sample must be accompanied with the appropriate submission form and payment. A quality sample is very important in getting an accurate diagnosis. If the problem is the canopy of a tree, a twig or a branch with leaves attached should be sent. If the problem is in the roots, the roots must be sent. The transition zone between healthy and diseased tissue is very important, because the best samples are those plants and plant parts that are in active decline. Plants dead for a long time are usually not sufficient. Of course, whole plants, while not always the most practical, are always best. Photographs are a great way of sharing information and the inclusion of photographs with the sample (or by email) is strongly encouraged. Sample quality also includes a completed submission form. The more information we have at our disposal, the better we can address the problem. Our contact information, mailing addresses and driving directions can also be found on the website: www.njaes.rutgers.edu/services. Most samples should be submitted by mail to Rutgers Plant Diagnostic Laboratory, PO Box 550, Milltown, NJ 08850. For delivery services like UPS or Fed Ex or drop-off, the current campus address is: Geiger Turfgrass Education Building, 20 Indyk-Engle Way North Brunswick, NJ 08902. The Geiger Building is located on the turfgrass research farm, near the Rutgers Gardens, off of Ryders Lane in North Brunswick. The Plant Diagnostic Laboratory responds by email or fax and every client receives a paper copy of the diagnosis including an up-to-date, scientific evidence based control solution. We make every attempt to include cultural, biological, and chemical options as well as organic approved product choices. Samples are done on a first come-first served basis and we move as fast as we can. If you have questions about accessing the laboratory services or need help submitting a sample please call the laboratory staff at 732-932-9140. This article was written by Richard Buckley, Director of the Rutgers Plant Diagnostic Laboratory. Rutgers New Jersey Agricultural Experiment Station provides soil testing and plant diagnostic services to residents of New Jersey.